서양에만 있고 우리나라에는 없는 것으로 생각되었던 질병이 뒤늦게 국내에서 진단되는 경우가 있습니다. 그 중 하나가 familial mediterranean fever입니다. 간헐적 복통, 온몸의 피부 발진과 전신적 열감 등의 증세로 응급실이나 외래를 전전하는 환자에서 잊지 말아야 할 중요 감별진단입니다. 진단 기준으로는 Tel-Hashomer criteria가 많이 언급되고 있습니다만 최근에는 유전자 검사가 거의 필수입니다. 2013년 12월 10일 이화여자대학교 목동병원 2층 대회의실에서 열렸던 제 102회 대한소화기내시경학회 집담회에서 한 증례가 소개되었습니다. 여러번 응급실을 방문하여 많은 검사를 받았으나 진단이 되지 않다가 뒤늦게 16번 염색체 MEFV 유전자 돌연변이가 있는 familial mediterranean fever로 확인된 경우였습니다. 당시 우리나라에 성인 3 증례, 소아 1 증례가 있다고 들었습니다. 일본에서는 수백명 이상이 보고되고 있습니다. 알고 있어야 진단할 수 있는 병이라고 생각합니다. 2015년 올해에는 저도 한 증례 발견하고 싶습니다. Findings of abdominal CT. (A) Left sided small bowel (probably jejunal loop, arrow) wall thickening and multiple enlarged mesenteric lymph nodes. (B) Small amount of pelvic fluid collection. Results of the DNA analysis of the MEFV gene mutation analysis (c.[329T > C; 442G > C] + [442G > C]). Familial Mediterranean fever (FMF) is a hereditary autoinflammatory disease that is prevalent in Mediterranean populations. While it is considered a rare disease in the rest of world, a significant number of FMF patients have been reported in East Asia, including Japan. Our aim was to determine the prevalence of FMF in Japan and elucidate the clinical and genetic features of Japanese patients. A primary nationwide survey of FMF was conducted between January and December 2009. Hospitals specializing in pediatrics and hospitals with pediatric, internal medicine, and rheumatology/allergy departments were asked to report all patients with FMF during the survey year. The estimated total number of Japanese FMF patients was 292 (95% confidence interval, 187-398 people). We evaluated the clinical and genetic profiles of Japanese patients from the data obtained in a secondary survey of 134 FMF patients. High-grade fever was observed in 95.5%, chest pain (pleuritis symptoms) in 36.9%, abdominal pain (peritonitis symptoms) in 62.7%, and arthritis in 31.3%. Of the patients profiled, 25.4% of patients experienced their first attack before 10 years of age, 37.3% in their teens, and 37.3% after age 20 years. Colchicine was effective in 91.8% of patients at a relatively low dose (mean dose, 0.89 ± 0.45 mg/d). AA amyloidosis was confirmed in 5 patients (3.7%). Of the 126 patients studied, 109 (86.5%) were positive for 1 or more genetic mutations and 17 (13.5%) had no mutation detected. Common Mediterranean fever gene (MEFV) mutations were E148Q/M694I (19.8%) and M694I/normal (12.7%). The differences in the prevalence of peritonitis, pleuritis, and a family history of FMF were statistically significant between FMF patients with MEFV exon 10 mutations compared with those without exon 10 mutations.In conclusion, a significant number of patients with FMF exist in Japan. Although Japanese patients with FMF are clinically or genetically different from Mediterranean patients, the delay in diagnosis is an issue that should be resolved. 2015년 Gastroenterology에 familial mediterranean fever 1예가 소개되었습니다 (PubMed). 일본 증례인데 capsule endoscopy 사진이 흥미로웠습니다. Question: A 57-year-old woman was admitted to our hospital with upper abdominal pain, accompanied by a fever of 38.6°C and panperitonitis. She had experienced the same symptoms of fever and panperitonitis for the previous 2 years. The symptoms would disappear after 2-3 days, but this cycle repeated every few months, and she had frequently been admitted to other hospitals for short durations. The patient had previously undergone surgery for appendicitis, but had no history of oral medication. Laboratory tests on admission revealed a white blood cell count of 17,660/mm3, neutrophil count of 14,834/mm3, and C-reactive protein level of 6.83 mg/dL, indicating a strong inflammatory response. Swelling of the mesenteric lymph nodes and an elevated density of mesenteric fatty tissue were noted on abdominal computed tomography (FigureA). Upper gastrointestinal endoscopy and colonoscopy did not reveal any abnormalities. Capsule endoscopy (CE) revealed hyperemia and erosions with white exudate in the jejunal mucosa (FigureB). Double balloon endoscopy (DBE) revealed hyperemia, edema, fragility, and erosion in the jejunum mucosa (FigureC). What is the diagnosis? The patient had no history of nonsteroidal anti-inflammatory drug use and, although various types of infection (bacterial, viral, and parasitic infections) and autoimmune disease were included in the differential diagnosis, all were rejected. A biopsy of the reddish erosions of the jejunal mucosa was performed by DBE, and neutrophil-dominated inflammatory cell infiltration was found, focused in the lamina propria of the mucous membrane (FigureD). The patient was treated with fasting, transfusions, and intravenous antibiotics. After 3 days, the fever and abdominal pain had dissipated. On the day 14 after admission, CE revealed that the hyperemia and edema in the mucosa had markedly improved. The patient was temporarily discharged before a definitive diagnosis was reached. However, she continued to experience the same symptoms (fever ≥38°C and abdominal pain) every few months, and these would naturally dissipate with only fasting and transfusions after 2-3 days. These findings met the Tel-Hashomer criteria for familial Mediterranean fever (FMF), and because the symptoms did not recur after the initiation of oral colchicine, a definitive diagnosis was obtained. CE, performed after colchicine was started, revealed normal mucosa in small intestine (FigureE). MEFV gene analysis revealed no mutation. FMF is a monogenic, autoinflammatory disease characterized by recurrent fever associated with serositis that lasts <3 days. FMF is caused by mutations in the MEVF gene, which is located on the short arm of chromosome 16, although nearly 10% of FMF patients with the MEFV gene are normal. Although only a few endoscopic findings have been reported, colonoscopy revealed hyperemia, fragility, and patchy ulcerations with white exudate in the large intestinal mucosa. 3 To our knowledge, this case report is the first study to describe observations for the small intestine, which, because they are similar to the findings for the large intestine described previously, indicate that CE and DBE are useful in the diagnosis of FMF. Intestinal Research 7월호에 임신 중 증상이 호전되었던 FMF 환자 증례가 실렸습니다 (논문 링크). 한림대병원 환자였습니다. 환자는 intestinal nonrotation으로 장이 한쪽으로 쏠려있는 상황이었지만 FMF와 관련성은 없어보였습니다. 진단이 어려웠던 모양인지 불필요한 수술을 한 적도 있었습니다. 흥미로운 증례라고 판단되어 소개합니다. 그림과 초록을 옮깁니다. 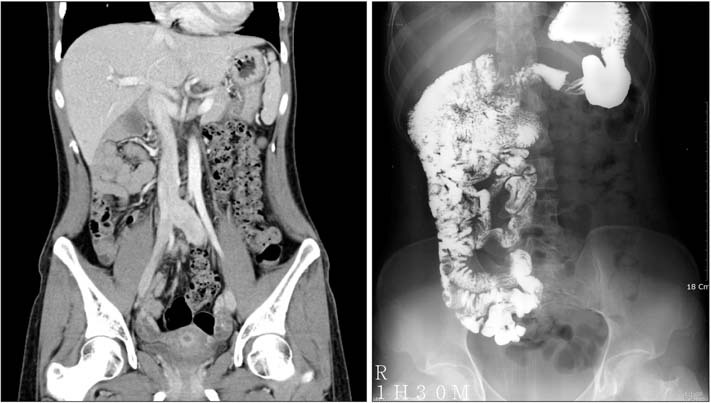 Findings of abdominal CT and small bowel follow-through. Abdominal CT (A) and small bowel follow-through (B) showed nonrotation of the intestine, with the small intestine located to the right of the midline and the colon to the left of the midline. Familial Mediterranean fever (FMF) is an inherited autosomal recessive disorder, ethnically restricted and commonly found among populations surrounding the Mediterranean Sea. FMF is the most prevalent autoinflammatory disease; is characterized by recurrent, self-limited episodes of fever with serositis; and is caused by Mediterranean fever gene (MEFV) mutations on chromosome 16. We describe a case of adult-onset FMF with complete symptomatic remission during pregnancy, without the use of colchicine. A 25-year-old woman had presented with periodic fever, abdominal pain, and vomiting since she was 21. Her abdominal computed tomography scan showed intestinal nonrotation. She underwent exploratory laparotomy and appendectomy for her symptoms 1 year prior. She had a symptom-free pregnancy period, but abdominal pain and fever recurred after delivery. Mutation analysis of the MEFV gene revealed two point mutations (p.Leu110Pro and p.Glu148Gln). We report an adult female patient with FMF in Korea with complete symptomatic remission during pregnancy.